I don’t know about you, but it is easy to be that person at the party who brings the festivities to a halt. “Hey Peterson, what’s going on in your life and work?” I straighten up, smile, and say, “I’m really excited about my presentations about climate change.” People tense up. They expect the prophet of gloom and doom and shame and blame to start spewing forth. It is easy to do. Climate change is downright dire and scary. I learned a long time ago though when talking about sexuality and the Bible, people need help to come close to these hot topic issues that stir up strong, negative emotions. Sara Peach at Yale Climate Connections asked me about the role of comedy and climate change communication, so I told her about the Homo No Mo Halfway House. Toscano said in a recent interview that comedy can be an effective strategy for engaging people in difficult topics. Toscano, who is gay, spent nearly two decades undergoing conversion therapy, the discredited practice of attempting to alter a person’s sexual orientation. After abandoning the therapy and coming out, he struggled to talk about the harm he had experienced. Toscano said sharing his experiences in this way made the topic more approachable. To read more of the article (and see delightful gifs of Debbie Downer from Saturday Night Live) check out Yale Climate Connections’ Advice Column. As a lover of comedy, I tend to watch a lot of sitcoms and standup. Lately I have been obsessed with the short silent films Buster Keaton created over 100 years ago. I am also reading David Bianculli’s book about the Smothers Brothers, a comedy duo who had an American TV show that paved the way for so many people and was a pre-cursor to Saturday Night Live. While zany slapstick comedy works for me just fine, I do appreciate comedy with a message behind it. As someone concerned about climate change, I am always on the hunt for good climate change comedy. It is harder to find than you might imagine. While people love making fun of those people who are dismissive of climate change, beyond mocking these folks, there has been little comedy produced around climate change. I was thrilled to interview Brian Ettling, a climate change comic who landed a national appearance on the Tosh.O TV show. Brian and I have a fun, free-wheeling conversation about the role of comedy, the challenges of climate comedy, and how talking about climate change is like passing gas at a dinner party. Lots of laughs and insights. Check it out at Citizens’ Climate Radio. You can hear Citizens’ Climate Radio on iTunes, Stitcher Radio, SoundCloud, Podbean, Northern Spirit Radio, Google Play, PlayerFM, and TuneIn Radio. Also, feel free to connect with other listeners, suggest program ideas, and respond to programs in the Citizens’ Climate Radio Facebook group or on Twitter at @CitizensCRadio. If you listen on iTunes, please consider rating and reviewing us! 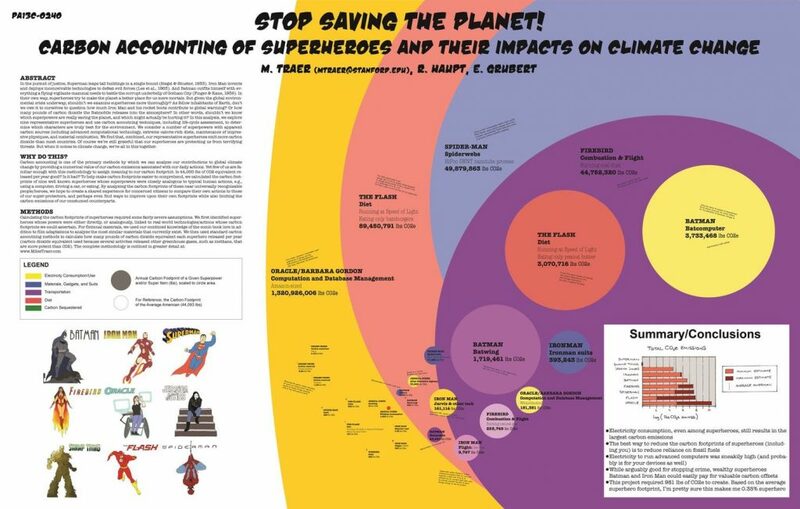 Sarah Kaplan at the Washington Post published a piece, Superheroes might save the world, but they’d totally wreck the environment. Scientists trying to engage the public in good science are turning to pop culture. To run at the speed of light, the Flash would need to consume 59,863,610,416 calories per second — the rough equivalent of a 12-foot tall hamburger every week. 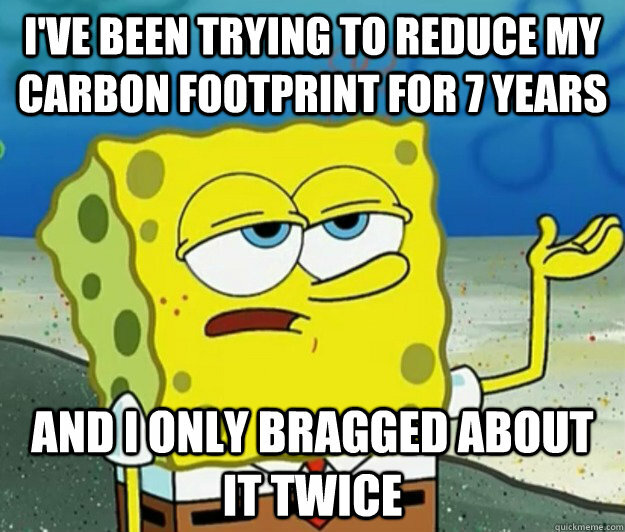 That adds up to nearly 90 million pounds of carbon dioxide per year. Meanwhile, flying alone would require Batman to burn the fossil fuel equivalent of 344 plane rides from New York to San Francisco. This reminds me of when the US Center for Disease Control outlined the protocol of how to address a Zombie Apocalypse. Read Kaplan’s article for yourself. In addition to pollution, scientists take on the Ice Wall in Game of Thrones and the superpower of carbon sequestration that the Swamp Thing possesses. New Web Series — Funny, Smart, and Really Good! I am so grateful to Daisy Simmons over at Yale Climate Connections for writing about The North Pole show, a new web series about a group of friends in Oakland, CA. What a blast! I love how it plays with the stereotypes of environmentalists and re-centers the conversation to look at earthlings in cities, gentrification, justice, and friendship. The North Pole is a political comedy web series that hits on our generation’s biggest social issues: Gentrification. Global warming. Gluten-free donuts. The show follows three best friends born and raised in North Oakland, CA (better known to locals as The North Pole) who struggle to stay rooted as their neighborhood becomes a hostile environment. Across seven outrageous episodes, Nina, Marcus, and Benny fight, dream, and plot hilarious schemes to save the place they call home. Facing both local displacement and global climate change, they combat evil landlords, crazy geoengineering plots, and ultimately each other. It is the connecting of these various issues that do not normally get into the climate change conversation that makes this show shine. Check out the trailer. Nina, Marcus, and Benny head on a unique tour of their rapidly changing North Oakland neighborhood. Hit with an unexpected rent hike, they have to find a creative solution to stay in their home. There was nothing in my previous work as an LGBTQ human rights activist and as a queer Bible scholar to indicate that I would make a radical shift to climate action. These days I spend much of my time thinking, researching, writing, and talking about climate change. I lead workshops on climate communication, I perform on stage, and I produce a monthly podcast about it. 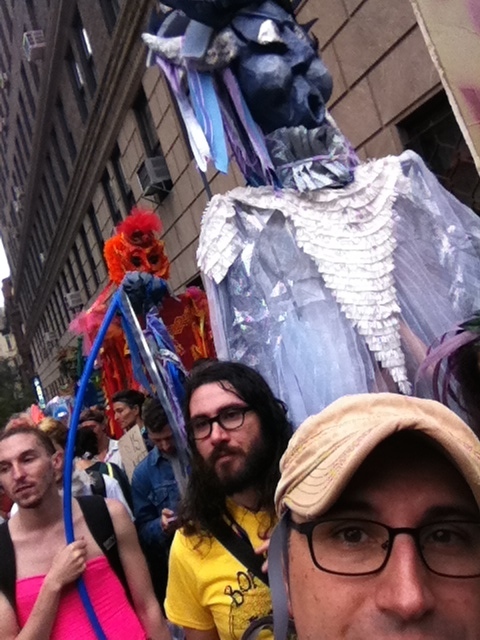 Here I am coming out at the People Climate March with the Queers for the Climate. See peeking in the bottom of the frame. So what happened? How did I go from being aware and concerned but not engaged to someone who can’t stop talking about climate change? Did I receive a Al Gore into my heart? Did I have an encounter with a polar bear? Did I get abducted by environmentalists? Nope, none of the above. 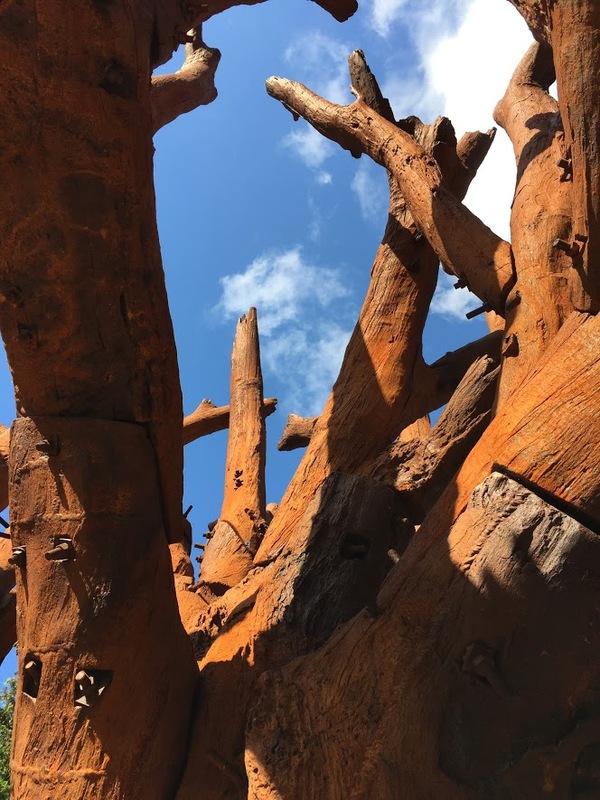 It was love that drew me into climate work, love for my husband, Glen Retief, who suddenly felt gripped by the reality of climate change and initially powerless to do anything about it. His distress triggered something in me that led me to learn more. But what ultimately woke me up to the reality of climate change was not any of the normal triggers. 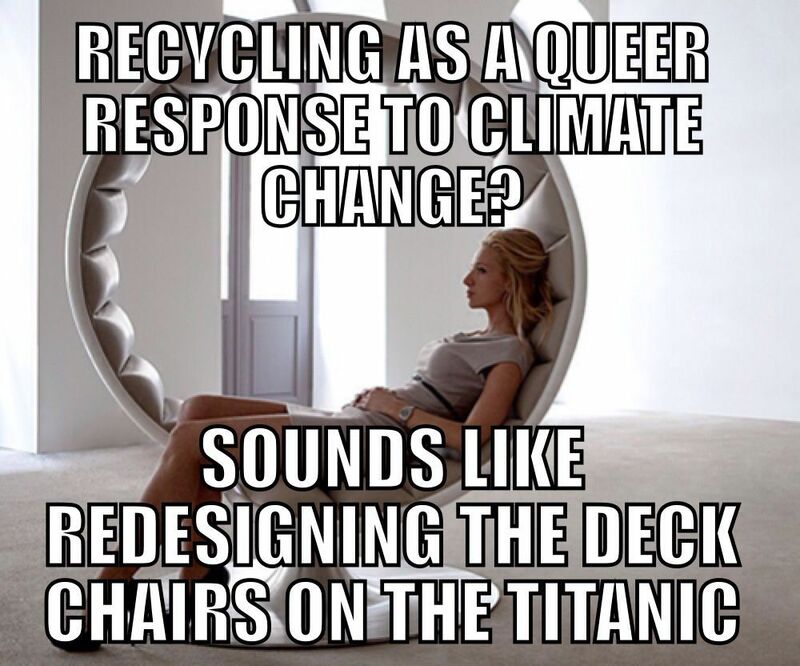 No, my climate story is definitely queer. It had nothing to do with polar bears and everything to do with pasta. In this video I break it down for you. Yes, I am shallow, but that shallowness got me engaged, so that’s something. Coming Out Again? This time as a climate weirdo. from Peterson Thomas Toscano on Vimeo. As a preacher, Elizabeth Jeremiah is willing to use pretty much any topic if it will help her make a point. In her latest video she expounds on the dangers of a generational curse, and to do this, she uses the example of fossil fuel pollution, which is a stock pollutant. It stays up in the atmosphere for up to a hundred years. It may sound silly, but this preacher lady has some profound points to make. AND she is assisted by some adorable pugs! 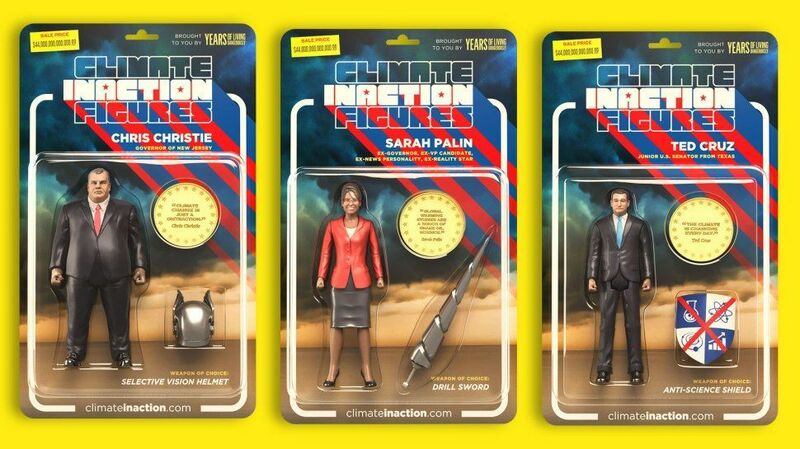 Yesterday I saw these clever and hilarious Climate Inaction Figures created by the folks who do the TV series Years of Living Dangerously. Funny stuff. Great details. 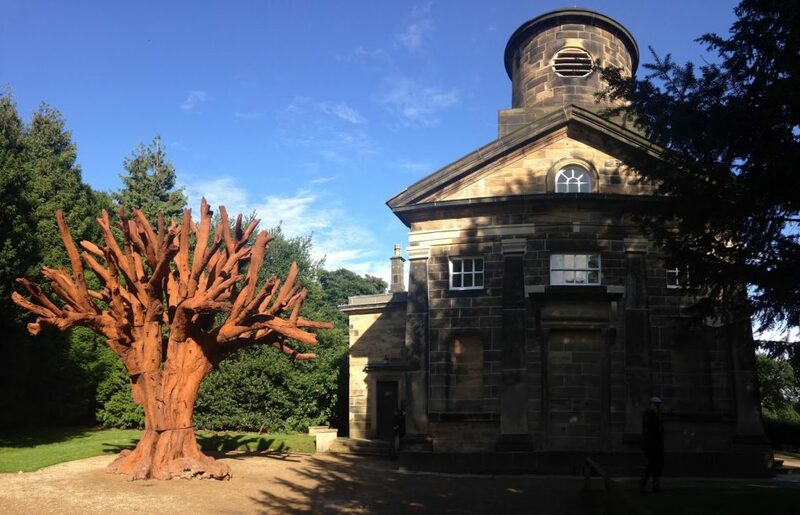 No doubt this sort of thing is a real a crowdpleaser with a lot of my Quaker friends and progressives. I find them to be cute but boring. I have been exploring climate comedy, and it seems the number one place comics and humorists go is to make fun of people who deny the reality and danger of global warming. Yes people are frustrated and annoyed with politicians and businesses who actively deny the reality and danger of climate change, and in some cases even outright lie and deceive the public. This requires a response. Humor is one of them for sure. Late night talk show hosts have been mocking these folks for years now. It’s gotten old, though. Comics, 2011 wants its climate comedy back. But besides being boring, is there a bigger problem with this sort of climate denial comedy? Could it actually lead to more inaction, even by the very people who say they are alarmed? I have been thinking about the effect these comic jabs have on the people laughing it up the most. I find that each jab can actually serve as an inoculation. 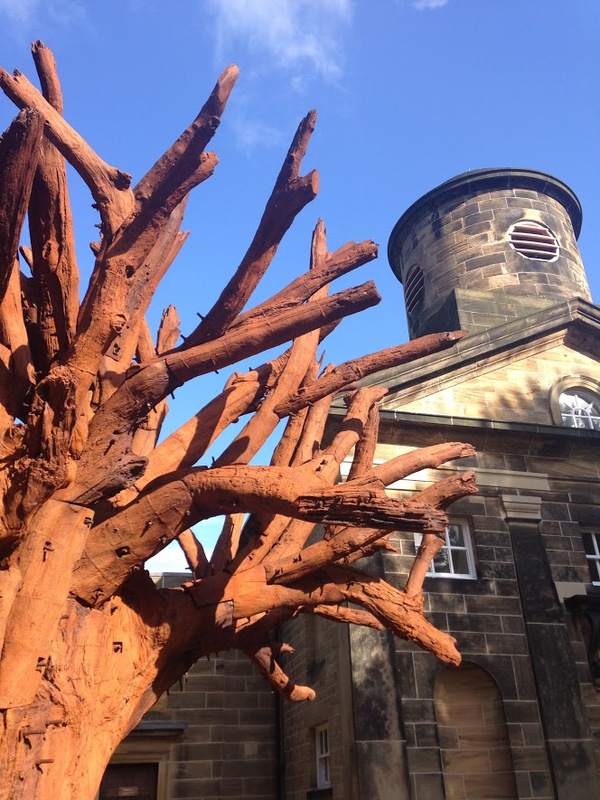 By looking at the extreme cases of denial, do we exempt ourselves from considering our own denial and inaction? It is easy to see another’s faults, but much harder to find the speck or log in our own eyes. I see this happen when I lobby Democrats in DC. I talk climate action, and they immediately point their fingers to members of congress across the aisle. “Listen I know climate change is happening, unlike those clowns over there.” Then they go off to list all of the environmentally friendly, but mostly futile efforts they have been making, at least futile when it comes to actually addressing climate change. It reminds me of the days when I did a lot of LGBTQ activism. I would visit a church that was not open and affirming to LGBTQ people: they did nothing proactive. LGBTQ people were second class citizens. These church leaders did not see their intolerance and discrimination. They were blinded by their fellow believers hate. They would puff out their chests and point to the Fred Phelps “God hates Fags” crowd and say–Oh, those people are awful. We are not like them at all. Inaction is inaction regardless if someone is vocal about it or simply passive. Climate change is difficult to grasp. It is so large. It is easy to deny the reality of what is going on in our world. In fact, I think most people in the USA are in some level of denial. Some are just more flamboyant about it. I am a big fan of comedy; it is what I do. Besides being downright lazy comedy, making fun of people who deny climate change is distracting. 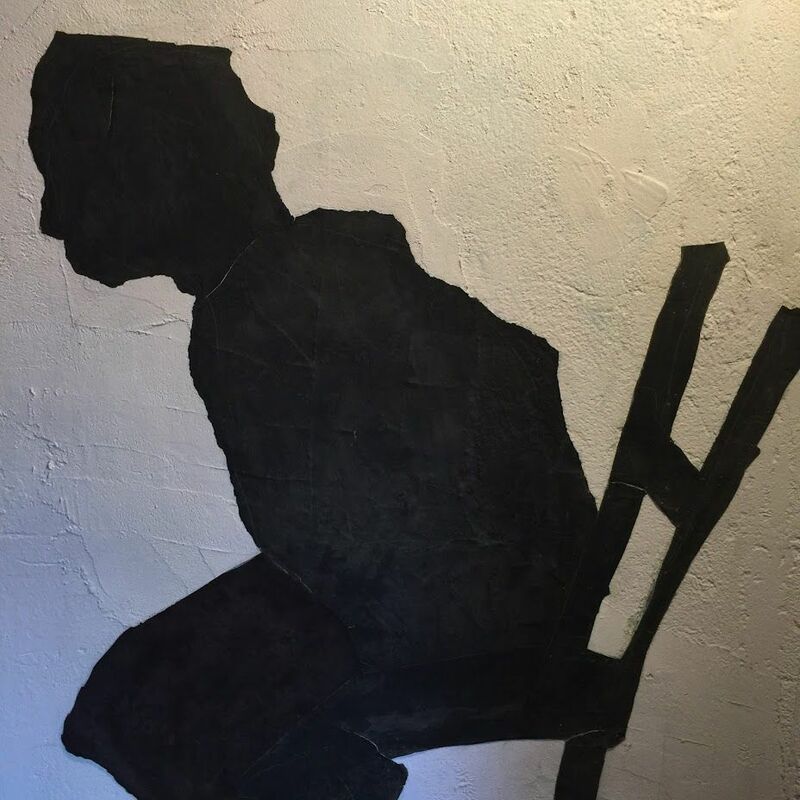 It dehumanizes people who for a variety of reasons are refusing to acknowledge the trouble we are in. These public officials represent many people who feel similarly. How do we get past simply mocking them to using comedy to explore what the heck might be going on for some of them. Also, we have the opportunity to focus our comic lenses on the places where we live in denial and inaction–not to make light of the situation, rather to shine light on ourselves. Did Jesus contribute to global warming?!? Climate Stew commentator, Elizabeth Jeremiah, knows a thing or two about the Bible. In this short video she alleges that Jesus of Nazareth was a big ole polluter. After his famous resurrection, what does he do? Burns fossil fuels. She claims she has biblical support for this wacky notion. And you know what, she’s right! 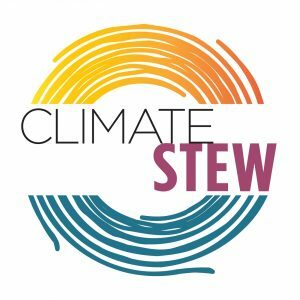 If you like what you hear, check out Elizabeth Jeremiah in the latest episode of Climate Stew podcast. It gets down right wonderful. Everyday I learn something new about Marvin Bloom, our roving reporter In his latest comic monologue, Marvin reveals details from his childhood that led to the family exodus from Brooklyn to Long Island. No it was not murderous Egyptians that made them take flight; rather it was pollution. Does Marvin Blame his Mother for his Asthma Attacks? Marvin talks about the triggers to his childhood asthma attacks, including the storytelling of his Aunt Sylvia, a holocaust survivor with a wicked sense of humor. He also shares new findings that show disturbing connections between pollution and pregnant mothers leading to asthma in babies and small children. I particularly appreciate the environmental justice part of his short monologue. He highlights that neighborhoods where Black and Hispanic people live in NYC have worse pollution and correspondingly high rates of asthma in children and adults. Hi This is Marvin, Marvin Bloom, and this is your moment with Marvin. Alright, so I live in Long Island, NY. It’s very nice. But I was born in Brooklyn. You could say I’m a refugee. I needed to find refuge from asthma. I was a very happy kid growing up in Brooklyn. But I had asthma—bad. It was always there lurking in my lungs. Lots of things set it off. The mold in Grandma Bloom’s house. The car fumes from the BQE highway that loomed over us. And then there was my Aunt Slyvia. She triggered my asthma all the time. It was her amazing sense humor when she told stories about how she escaped the Nazi’s dressed as a nun. She put a towel over her head as she prowled around the living room evading capture. I laughed so hard. But laughing like that wasn’t good for me. Her comedy stirred up my asthma. Well and her cigarette smoking didn’t help. As a kid I also didn’t help matters much. I was very hyperactive. I ran around the house, there was too much pollution to play in the streets. Then I started wheezing. My airway became constricted. Swollen. It filled with mucus. I couldn’t catch my breath. One time I even passed out. I woke up in an oxygen tent in the hospital. My mother’s face was pressed up against the plastic like a mosquito trying to get at me. After that my mother refused to let me run around. She would literally tie me to a dinning room chair. But I still had asthma attacks. I kept missing school. And I got behind. According to the Centers for Disease Control, because of asthma, there are more than 10 million lost school days every year. And adults lose over 14 million work days annually. My mom was beside herself. She kept saying to my father, ‘Saul, we need to get out of this neighborhood. It’s killing Marvin.’ Which was true—I regularly inhaled dust, soot, diesel exhaust, sulfur dioxide and nitrogen oxide from coal-fired electric plants. 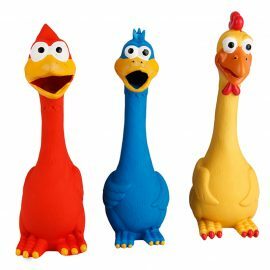 This is what I was breathing in as a kid. And it triggered my asthma. But it started even before sucked the bad air into my lung. When I was just a fetus breathing in amniotic fluid, the pollution got to me. A new study reveals Babies born to mothers exposed to air pollution from traffic during pregnancy have an increased risk of developing asthma before the age of six. If a woman lives close to a highway during pregnancy, her kid has a 25 percent increased risk of developing asthma before age 5. For me it was bad. So when I was 9 years old we moved to Long Island. Even though it was a longer commute for my father and I left all my friends behind. But we were the lucky ones. We were able to get out. We found a neighborhood that was healthy that let us move in. Lots of white families Christian and Jewish in the New York area can escape the pollution that causes asthma. In fact, white people in the NYC area breath in clearer air than Black and Hispanic people. Consider kids hospitalized because of Asthma. In New York City 43.7% of Hispanic kids 17 years and younger landed in the hospital with asthma. 72.8% of Black kids were hospitalized. And white kids? 9.5%. 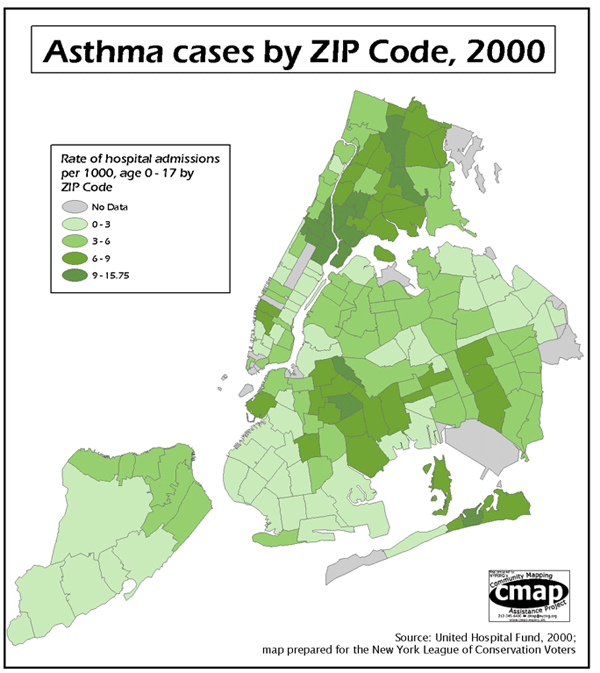 Look at the maps that compare asthma rates and New York neighborhoods. Disease increases with pollution. Ok. And the pollution increases within Black and Hispanic communities. Their environments are severely toxic. That’s not right. But here’s the good news. Real Climate action will immediately improve people’s health. We must Increase fuel efficiency in cars, drive less, stop burning coal in power plants Not only will it address climate change—it will give us cleaner air in every neighborhood and healthier bodies. This is Marvin, Marvin Bloom. And This is your Moment with Marvin. We welcome two zany characters to the show–Elizabeth Jeremiah, who wants us to think about our polluting ancestors in a kinder light, and Marvin Bloom, who draws on his own weird story of trying to de-gay himself as a way of talking about climate denial. 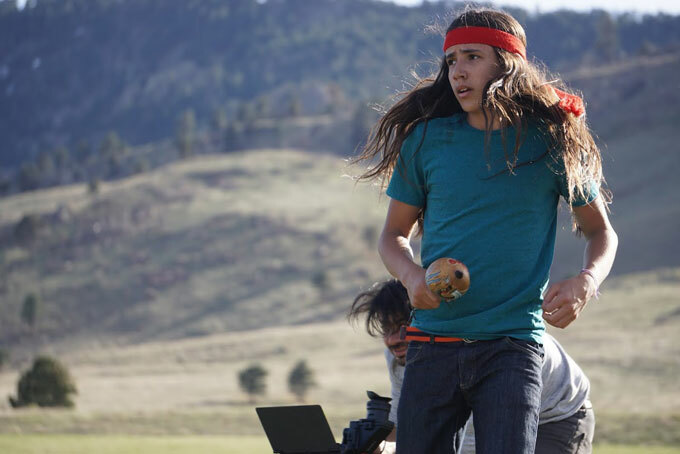 We also get a report from Yale Climate Connections about Xiuhtezcatl Martinez, a 15 year old hip hop artist who is taking on climate change. 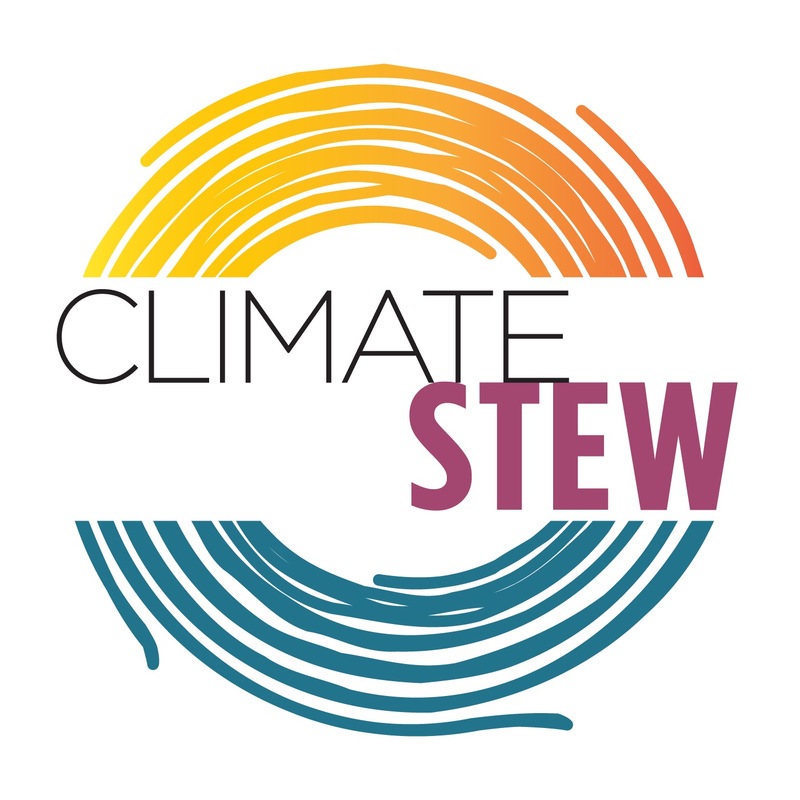 Climate Stew is available on iTunes, Stitcher, SoundCloud, or Listen here on our site. We have a special Facebook Group for people who want to discuss upcoming episodes and delve deeper into the issues. We want to hear your ideas. Peterson tweets about climate change, LGBTQ concerns, faith, and lots of weird stuff, so feel free to follow and jump into the conversation. And don’t forget to share Climate Stew with your friends. Doin’ Time in the Homo No Mo Halfway House, Peterson’s comic exposé of gay conversion therapy. Hello and welcome to the 39th episode of Climate Stew. I am your host, Peterson Toscano. This week I am in Arizona as part of my Southwest Tour. I may be out of the studio, but I have a full climate stew crew ready to serve you some hot and spicy news and views about global warming and our roles on a new planet. Our special guest today is Elizabeth Jeremiah who specifically requested to be on today’s program. I have no idea what she will say. You will also hear from Marvin Bloom with his new regular feature, Your Moment with Marvin. But first Anthony Leiserowitz From Yale Climate Connections has a story for us about a 15 year old hip hop artist who is making waves in the climate world. The story was produced by Diana Madson. The U.N. climate conference has a theme song this year . . . and it’s written and performed by a 15 year old. That’s Xiuhtezcatl Martinez and his group of eco hip hop artists performing “Speak for the Trees,” a song that encourages young people to raise their voices to fight climate change. Martinez was just six-years-old when he spoke at his first climate rally. And in 2013 he was honored with a community service award by President Obama. Though still in high school, he has now addressed global leaders, and is youth director of Earth Guardians, a group mobilizing young environmental activists. While Martinez is passionate about protecting the planet, sometimes he just wants to be a kid. 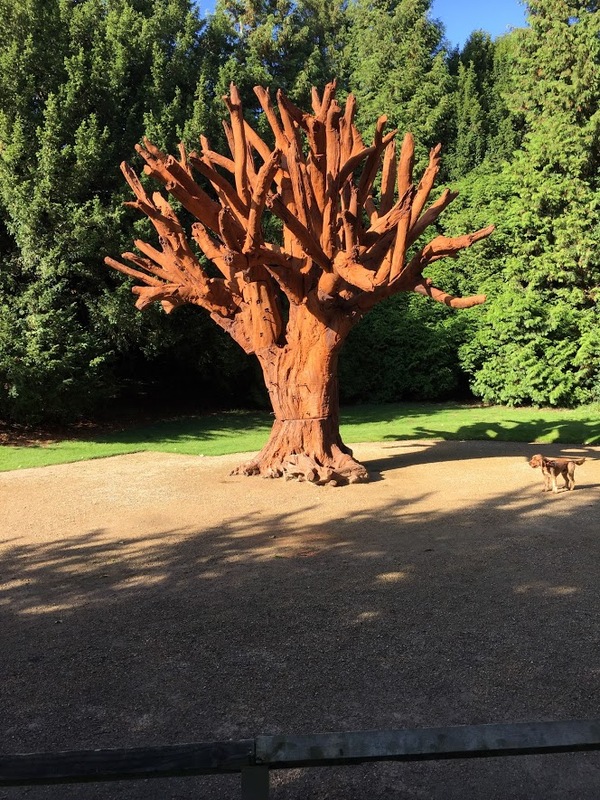 He hopes his efforts inspire others to take responsibility for the earth and carry the torch after him. Reporting credit: ChavoBart Digital Media/Aren Zolninger. Photo: Xiuhtezcatl Martinez (source: Earth Guardians). This is Elizabeth Jeremiah from the Elizabeth Jeremiah global worldwide ministries in Jesus. I do not like it when people are dishonest. For instance, Lots of homosexuals and liberal theologians are claiming that King David of Israel, a man after God’s own heart, was himself a homosexual. They say this because King David, before he was king, was very close friends with Prince Jonathan. They made vows to each other, laying in the field together, naked. The scriptures states that David loved Jonathan with a love greater than that for women. Later in life David adopted Jonathan’s orphaned disabled son in as one of his own. No doubt they were intimate, but men in some cultures are. But That doesn’t mean they’re homosexuals. David most definitely as NOT homosexual. He liked women great. He had many wives and concubines and a multitude of children from those women. In fact, he liked women so much that after he oogled Bathsheba taking a bath on her rooftop garden, he went out of his way to assassinate her husband so that he could sleep with her. To me that is extreme heterosexual behavior. But if you insist on pushing the David and Jonathan love story, then at least be honest about it, and call David a bisexual. Now before Peterson cuts me off the air I can assure you there is a climate connection to all of this. Environmentalists love to shame us into behaving differently. They wag their self-righteous green fingers at us and our parents and grandparents. They accuse us of being greedy wasteful wicked consumers. They insist that our ancestors are responsible for destroying mother earth. They hate the modern period. Instead they hearken back to some pre-industrial utopia. Where people supposedly lived at peace and harmony with the land. loving each other in some sort of eco-friendly matrilineal Shangri-La. Let’s be honest, some of them ancient folks murdered, sacrificed the innocent, fought over pieces of property, and took advantage of each other just like we see some people do today. They just didn’t have as much technology and energy resources to do it on a global scale. So that’s why I take offense when people go on and on about how our direct modern ancestors are evil guilty of bringing climate change woe upon our heads. These accusers do not acknowledge that our ancestors helped humankind. Think of all the advances in medical science,, in our homes, with transportation, and education. Think of all of the extra time people have had to explore the world, learn new things, and to be with their loved ones. Technology coupled with so inexpensive energy helps get all the important work done—work that women and girls mostly do. Our great great grandparents had no idea that they were pumping into the air chemicals that ultimately would harm us. They simply used their God given ingenuity and creativity to build, expand, and dream. The same thing happened with the asbestos. What an amazing naturally occurring mineral. They dug up and used asbestos even before the time of Jesus. Plentiful and inexpensive, asbestos, which is fire resistant, is the best product for electrical insulation, sound absorption, and building insulation. Unfortunately asbestos also kills people. My daddy for instance. As a young man, working class, struggling to make his way in the world. He worked for time installing boilers. As a result he breathed in a bunch pounds of asbestos fibers. Sadly later in life, although he didn’t smoke a single cigarette, which is a disgusting vile habit, he’s succumbed to lung cancer. His doctor said likely it was the asbestos. And now he is with the Lord. So what do we do when we have something like asbestos or fossil fuels like coal and petroleum? They work wonders, and they are dangerous. Here’s another example My own niece, Vileen, is a fierce wonderful stay at home mom. Last year she took her one-year-old child to the doctors for his annual check up and was shocked to discover the child’s lead levels were through the roof. She couldn’t believe it. Her house, Their home, their safe space, was filled with a substance that could potentially affect her child negatively for life. Lead poisoning is bad and leads to neurological disorders and learning disabilities. so what did Vileen do? First she educated herself. She went online, she read books, she’s talked to experts, and then she and her husband, who is a wonderful man of God, set about to rid their lives of lead paint. It took them a lot of time and inconvenience and money. But The safety and health of their child is more important than anything else. People get angry and scared when they discover a threat lurking in their homes and in the very air they breath. We look for scapegoats. And yes while there have been greedy business men who have ignored warnings by their own experts, for much of our history, people did not know that the burning of coal and the use of petroleum would bring about global warming and these out of control weather events. Even Jesus, the greatest scapegoat that ever lived, Jesus himself, the spotless son of God, released carbon dioxide into the atmosphere. Of course he breathed it out like the rest of us. But also, it is recorded in John chapter 21 that he burned fossil fuels. The disciples, discouraged after Jesus’s arrest and execution returned to their fishing. Jesus, all resurrected sat on the shore. The disciples in their boat did not recognize Jesus at first. After he gave them helpful fishing advice they then knew it was their very own teacher sitting on the shore. And in verse 9 it says “When they landed, they saw a fire of burning coals there with fish on it, and some bread.” Yes, Jesus released greenhouse gas into the atmosphere in order feed his friends. And that is what humans have been doing for over one hundred and fifty years. They have been feeding family and friends and delighting them with gifts and trips and helping them with medical care and books and computers and what not. And yes, we need to find new sources of energy. But let’s stop all of this name calling and maligning our ancestors. Instead, let’s thank them for all the advances they gave us so that we can live better lives. This has been Elizabeth Jeremiah, from the Elizabeth Jeremiah Global Worldwide Ministries in Jesus, may God bless you and keep you and your whole household too. Hi everyone, this is Marvin, Marvin Bloom, and This is your moment with Marvin. Welcome to my new regular segment here at Climate Stew. Last episode we said good-bye to Timothy Meadows who lives in the future, and although at least one listener, Dave, is broken hearted and probably hates me, it’s time to move on. Peterson, Uh, Marvin. Remember what we talked about? Marvin: yes, Peterson, and I’m going to talk about Climate change too. Don’t worry. Ok a little background about me. Actually Peterson, who only ever talks about climate change, he and I have a lot in common. We’re both gay and we both tried to go ex-gay. Not at the same time. But for about three years I was involved in gay conversion therapy, where they tried to make me straight for Jesus. Well first I became a born-again Christian, a Jew for Jesus. it’s complicated. But in my defense let me just say, I was adopted. I mean biologically I may have Christian. But it doesn’t matter, I repented of Jesus. 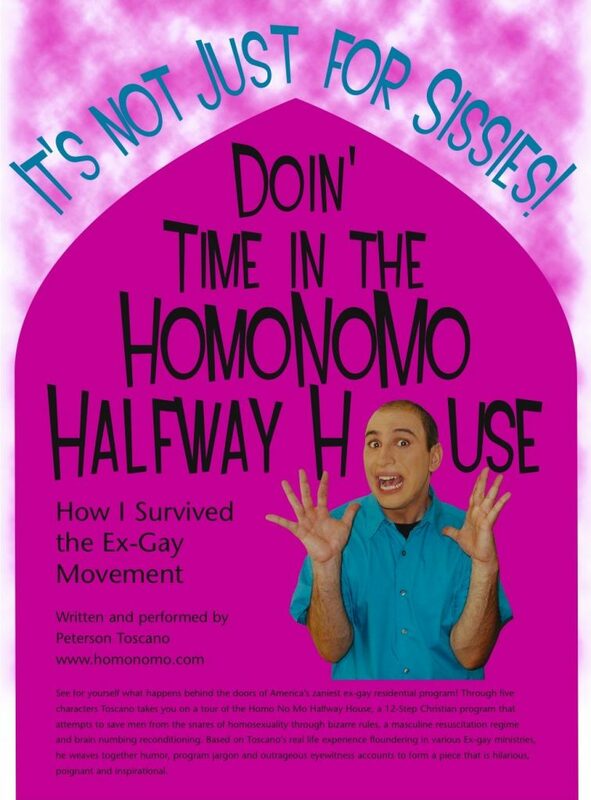 Now when I was a Christian, I hated being gay and tried to change through these awful programs. For a short time I was even the leader of an ex-gay group called Sword of Truth Ministry. You know, like the Sword of God Almighty unsheathed to drive through my gayness. Sword of Truth ministries. Of course thank God I eventually left all that, re-gayed and now I am totally gay. No doubt Elizabeth Jeremiah’s believes I am bound to hell in her hand basket. But I am comfortable in my skin and happily legally partnered to Tristian. And before Peterson cuts me off—let me say something about climate change. Ok, it’s like when I was in the ex-gay movement, trying to de-gay myself. I was on a destructive path. Why? because I believed a fantasy namely that it was wrong to be gay, unnatural, and that Jesus could fix me. Now some fantasies are fine to believe, especially for children, Santa Claus, The Hanukah Menora, the Tooth Fairy—which always creeped me out. But the gay to straight fantasy. Yeah, not so innocent. In fact, quite dangerous. But I wanted to believe a fantasy instead of owning up to reality. I feared what my life would be like, what my relationship with my parents would be like, if I came out gay. And its just like climate change. It’s easier to believe a fantasy that our pollution is not so bad or doesn’t add up and bring about a cataphrohe. It is easier to believe God will protect us no matter what and would never let us destroy humanity and most other living things. But to do so we have to ignore science and reality. We then look at climate change like it is the Easter Bunny, something to believe in or not, as if it was a matter of faith. And while some realities are hard to face up to at first, it is so much harder after you waste your whole life believing a fantasy. Then you finally accept the truth after its too late, and you are just a bitter old queen living on saltine crackers in Secuacus, NJ with no friends who really know you for who you are. So if your gay or trans or bisexual or lesbian or a climate denier, come out already and walk in the light. Yeah, I’m Marvin, Marvin Bloom, and this has been your moment with Marvin. Thank you Marvin and Elizabeth Jeremiah and the fine folks at Yale Climate Connectoins. You can see a transcript of today’s show over at Climate Stew dot com, check out the many links we have to learn more and to read Vincent Pawlowski excellent article Climate Change is not our fault. Special thanks to David Raher, Glen Retief, oh, and Joe Gee, who has recently started his own re-gaying ministry. Don’t ask. 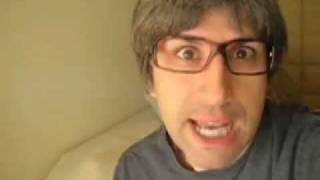 Come back soon for more Climate Stew.